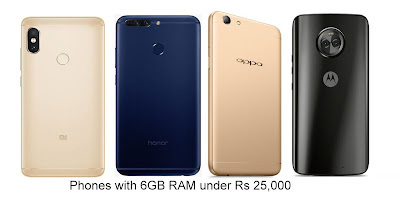 Nowadays Most of the Mid-range Phone comes with 4GB of RAM. Many smartphones Makers launching Phones with 6GB RAM. Here are Top Smartphones with 6GB RAM available in India under Rs 25,000. Infinix Zero 5 sports a 5.98-inch 1080p display powered by MediaTek Helio P25 Octa-Core SoC with 6GB of RAM. Dual SIM device runs Android 7.0 (Nougat), features 12-megapixel rear camera with wide-angle lens along with a 13-megapixel secondary camera with a telephoto lens offering 2x optical zoom and portrait mode. It also has a 16-megapixel front-facing camera with LED flash. Packed with a 4350mAh battery support for xCharge 18W fast charging. The Infinix Zero 5 comes with 64GB of internal storage and there is Zero 5 Pro that comes with 128GB internal storage. Infinix Zero 5 comes in Champagne Gold and Bordeaux Red colors priced at Rs. 17,999 and the Infinix Zero 5 Pro with 128GB storage comes in Sandstone Black color priced at Rs. 19,999. Nubia Z17 mini Limited Edtion launched for Rs 21,499. Nubia Z17 mini feature a 5.2-inch 1080p 2.5D curved glass display powered by an Octa-Core Snapdragon 653 processor with 6GB of RAM and 128GB of internal storage. has a unibody metal design. It has a dual 13-megapixel rear camera, one with monochrome lens and the other one with RGB lens, offering crisp shots.also has a 16-megapixel front-facing camera with 80-degree wide-angle lens. Packed with a 2950mAh battery with fast charging. Honor 8 Pro has a 5.7-inch (2560 x 1440 pixels) Quad HD LTPS 2.5D curved glass display powered by Octa-Core Kirin 960 processor with 6GB RAM, 128GB internal storage. On Camera it has a12MP (Monochrome) + 12MP (RGB) Dual rear cameras, dual-tone LED flash, f/2.2 aperture and 8MP front-facing camera, f/2.0 aperture Packed with a 4000mAh battery. Moto X4 features a 5.2-inch 1080p Display powered by an Octa-Core Snapdragon 630 Mobile Platform with 6GB RAM with 64GB storage which is further expandable to 2 TB with microSD.On Camera, It has dual 12MP and 8MP rear cameras to take images with blurred background, portraits, selective black and white an option to change the background. It has a 16MP front camera.It has IP68 certification for water resistance and runs on Android 8.0 Oreo. Packed with a 3,000 mAh battery. Priced at Rs 24,999.